JR East E1 Series "MAX"
The E1 Series "MAX" (Multi Amenity eXpress) was the first ever complete double decker shinkansen developed by JR East. The E1 was designed with maximum capacity as its main goal, targeting people who used the shinkansen for long distance commutes. Thus, non-reserved seating has a 3 by 3 seat layout with a tight walkway that makes on-board vending impossible. Between 2003 and 2006, all trains were updated with a newer interior and a change from the original grey paint scheme to a new blue, white and pink design. Despite being a relatively new train in JR East's fleet, the E1 was quickly replaced by the Series E4 which is capable of coupling with other Shinkansen on the Tohoku Shinkansen route. The E1 was retired from regular service on the Joetsu Shinkansen in late Sept. 2012. The E1 will continue to be used as a group reservation only train for the time being. 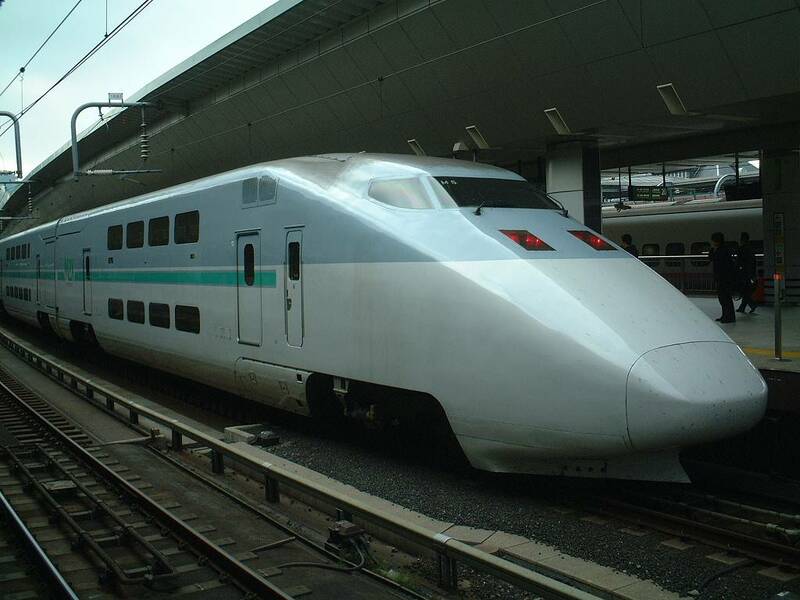 The E1 Series is the last Shinkansen to be constructed of regular steel.